The Spaniard with the time of 1'47 "635 has preceded a tenth of the Ducati. 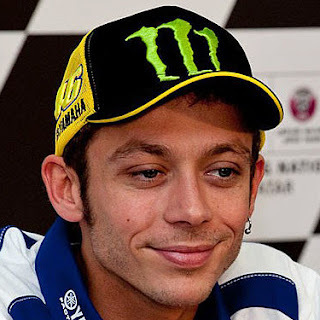 Valentino returned to record time, at three weeks from the tibia and peron fracture, gets the third time in qualifying. The super Valentino Rossi will jump from the front row in Aragon's Gp. The pole position went to Spaniard Maverick Vinales, Tavullia's teammate of Yamaha, who with the time of 1'47 "635 was ahead of a tenth of the official Ducati of Jorge Lorenzo. 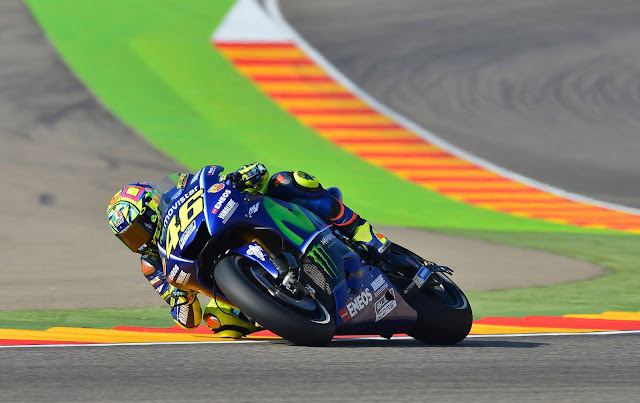 After the double fracture recovery and tibia and perone, Rossi makes another miracle and closes the qualifying with third time at just 180 milliseconds from Vinales. In second row Cal Crutchlow (Lcr Honda), fourth (+0.195) ahead of Marc Marquez's Honda (+0.328), protagonist of a fall just minutes from the end, and Dani Pedrosa (+0.472). 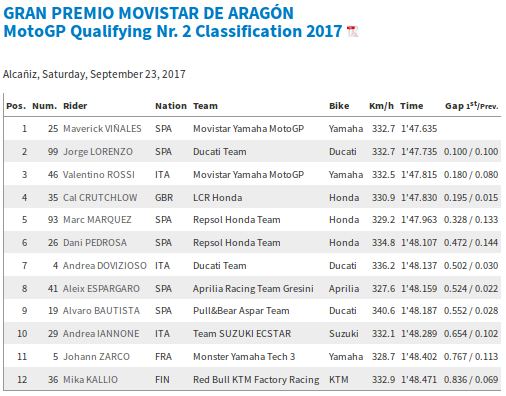 Seventh time for Andrea Dovizioso in Ducati (+0.502), followed by Avilia by Aleix Espargaro (+0.524) and Ducati by Alvaro Bautista (+0.552). To close the top ten Andrea Iannone (Suzuki), tenth with a delay of 654,000ths from Vinales. Then Zarco (Yamaha) and Kallio (Ktm). "I knew the bike was competitive on the dry, and we had to improve and in the afternoon we did so much and I also tried the tires for the race." So Maverick Vinales after winning the pole.